I was working on a project to come up with a name for a new company and, for reasons I won’t go into in too much detail in case I give away all my secrets, I wanted to look up all the adjectives in the English language that begin with A. So I logged on to AdjectivesStarting.com (other adjective listing websites are available) and there it was, first in the list: Abactinal. I don’t know about you but when I see a word like that sitting provocatively at the start of such an auspicious list, I have to investigate. So I clicked on it and the definition came up: “of or relating to the surface or end opposite to the mouth in a radiate animal”. I should have left it. But come on, we all want to know what a radiate animal is, don’t we? My cats radiate insouciance. Does that count? Apparently not. A radiate animal is one that is radially symmetrical – you know, symmetrical around a central point. Imagine an aerial view of Boris Johnson. But Boris is not a radiate animal – not in the strict zoological definition of the term anyway. Oh boy! I could tell I was being enticed deep into the dark forest by a trail of candy but I followed the trail nevertheless. I found myself stumbling through thickets of academia, where long, intimidating words scratched at my eyes. (The internet is full of such places if you wander off the beaten track.) Words like Ctenophora and Cnidarians. It felt like trying to do Biology revision while watching Star Trek. So now I had to divert down another track to find out what kind of word begins with a ‘ct’ or ‘cn’. We all know that a C at the beginning of a word should not be followed by a consonant, other than H, L, R or occasionally Y. It’s unnatural. Even the Greeks didn’t do it. They used Ks instead. It was the Romans who turned them to Cs. Thus the Greek ‘kteis’ (comb) gave us the aforementioned Ctenophora and ‘knide’ (nettle) gave us the Cnidaria. But what exactly are these mysterious radiate animals? What do they look like? Where do they live? How big are they? And should we be worried about them? And then I found it. We’re talking jellyfish, basically. 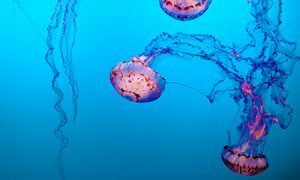 Jellyfish and corals and those luminous floaty things you see in footage from bathyspheres (there’s a word I’ve never written before) miles down in the darkest depths of the ocean. The nettle bit makes sense because Cnidaria are nasty stingy things, like box jellyfish and those pretty tentacled things that cling to coral and spoil your trip to the Great Barrier Reef. And the comb bit makes sense because Ctenophora are also called comb jellies because they look like a plastic bag that’s swallowed a large hair comb. They’re the ones that flit through the deep like ghosts and can grow up to 1.5m in length. And now the abactinal bit made sense, because these things are so fluid that the only way to find your way around round one is to identify the mouth and then navigate your way from that. It might not surprise you that, while abactinal is the first adjective in the dictionary, it’s also one of the least used. A Google search brings up a mere 304,000 results. Compare that to 1.85 billion for ‘academic’, 2.47 billion for ‘awesome’ and 3.47 billion for ‘amazing’. But all that could be about to change. Watch out for the Abactinal Pants Emporium, coming soon to a high street near you.